Grace Zimmerman is an experienced entrepreneur, in both the high tech and health care industries, with a long, successful track record of launching new companies and products in nascent, undeveloped markets requiring innovative marketing and sales approaches. Companies Ms. Zimmerman has helped to launch, have gone public, or been acquired and are still employing thousands of skilled professionals. The innovative approach to marketing long-term care insurance that Zimmerman pioneered in 1995 at CalPERS is still in use there and has been implemented in a national program for federal employees. 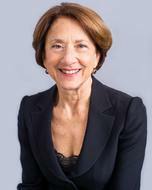 Ms. Zimmerman is a Professor of the Practice of Marketing at the International Business School at Brandeis University, and is an affiliated lecturer at the Heller School for Social Policy and Management. She was a founding member of the undergraduate Business Program Advisory committee and past MBA Program Director, and continues to teach both graduate and undergraduate courses in marketing. She is the 2007 and 2012 recipient of Brandeis’s Excellence in Teaching Award. Ms. Zimmerman’s community involvement includes her membership on the advisory board for David Project, a division of Hillel International. Ms. Zimmerman lives in Weston with her husband. She has two adult daughters. She is a graduate of Harvard Business School and Ohio State University.